Built to facilitate parking for Abbott Northwestern Hospital’s employees, the 330,000 square foot ramp is located just west of the redeveloped Midtown Market (Sears Building). The ramp currently rises five-levels, with typical bay areas measuring 25 by 56 feet, but is designed to support a future vertical expansion of an additional two. 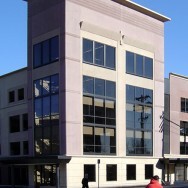 Retail and office tenants, including an exercise and medical treatment clinic, occupy the ground level of the west bay. The project also includes a tunnel to the north, running beneath 28th Street and connecting pedestrians to an existing tunnel on the other side. The ramp’s main structural system is post-tensioned concrete beams and slabs with fully encapsulated post-tension tendons. Foundations along the east side are placed between the existing west footings of the Sears building. Transfer beams are used at two locations to bridge across the existing footings to the new footings. Several floor levels of the new ramp align with the floors of the existing building. Knock-out panels can be removed in the future to provide vehicle access for additional parking in the existing building. All post-tensioning tendons were dead ended against this edge and stressed towards the west. 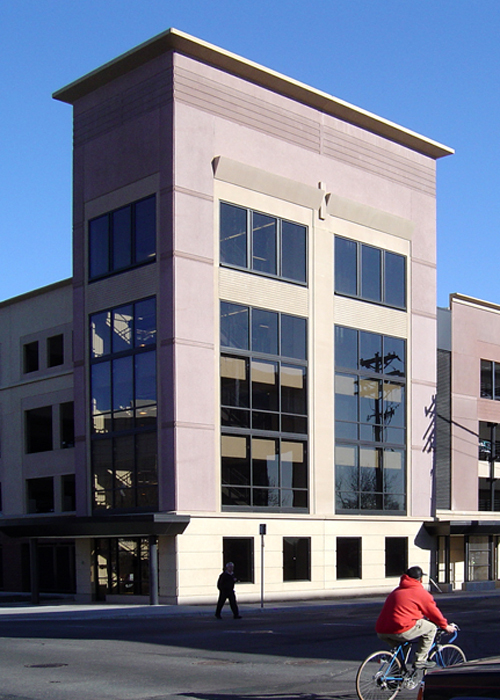 MBJ designed detailing that accommodates seasonal movements of the unheated parking structure above the retail area.